Some Charismatics and Pentecostals effectively separate the person of the Holy Spirit from the power that he imparts. As a very new Christian, I attended a public lecture by one of Britain’s great charismatic sons. He taught that the power of God was available for the taking. “Just reach up and plug in!”, he proclaimed. I believe this to be error. God the Holy Spirit is the source of supernatural power, and he imparts it to whom he wills. We do not ‘plug in’ to some impersonal energy field. God the Holy Spirit is the third person of the Trinity. He imparts spiritual energy to those of his children who ask. As always, Jesus is our prime example; so we need to start with an appreciation of how he ministered in the power of the Holy Spirit. In Luke 4:14 it states that “Jesus returned to Galilee in the power of the Spirit”. Here the inference is that the Holy Spirit empowered him. Verse 18 records how Jesus took his mission statement from the prophet Isaiah when he quoted, “The Spirit of the Lord is on me, because he has anointed me.” Once again, the text contains elements of both the person and the power of the Holy Spirit, “the Spirit of the Lord…” AND “…has anointed me”. The Gospel of Luke contains some significant references to the anointing. Luke 5:17 states that, “One day as he was teaching, Pharisees and teachers of the law, who had come from every village of Galilee and from Judea and Jerusalem, were sitting there. And the power of the Lord was present for him to heal the sick.” The Holman’s Christian Standard translation has:“And the Lord’s power to heal was in Him.” Luke 6:19 is even more specific where it records that “the whole crowd was trying to touch Him, because power was coming out from Him and healing them all.” Jesus possessed power to heal; he was full of a supernatural energy which issued from him and dramatically affected those to whom he ministered. Luke Chapter 8 records the incident when the woman touched Jesus’ garment and received healing. Jesus sensed that someone had touched him and responded to his disciples’ protestations with the words “Someone touched me; I know that power has gone out from me.” (vs. 46). Jesus received anointing at his baptism and, presumably, on subsequent occasions when he met with his Father in prayer. He received power at his baptism and somehow stored this power within himself. He then released the power to achieve his purpose of bringing glory to God the Father. Luke 24:49 records the Lord’s instructions to his disciples to wait in Jerusalem until they had received power from on high. This they did, and the book of Acts records how they went out in the power of the Spirit and ministered supernaturally in Jesus’ name. This pattern of empowerment, retention, and release didn’t only apply to Jesus, it also reflected in the ministry of his first disciples. This incident reveals even more. Peter addressed the lame man and said, “In the name of Jesus of Nazareth.” He evoked the name of Jesus to indicate that he was acting under the authority of the Lord Jesus Christ. Then he said, “walk!” He declared, instructed, and proclaimed with authority. He did not pray. He was acting on what he had observed in the life of his master. 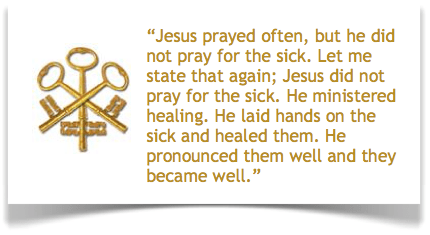 Jesus prayed often, but he did not pray for the sick. Let me state that again; Jesus did not pray for the sick. He ministered healing. He laid hands on the sick and healed them. He pronounced them well and they became well. Acts 5:15-16 contains another intriguing reference to the anointing that was upon and within Peter. It records that, “people brought the sick into the streets and laid them on beds and mats so that at least Peter’s shadow might fall on some of them as he passed by.” Now why would they do that? A shadow is just the absence of direct light, so why would people attribute healing power to Peter’s shadow? The way that I understand it is that a shadow indicates the close proximity of the object casting the shadow – Peter was walking past the sick people, and the power within him was radiating out of him and healing some of the afflicted. Like his master before him, power was coming out from him and healing them! Hi. I think the 3 P’s are really good and could revolutionise the world but it would still be great if there was an actual reference. I know when I sell IT solutions that I might be selling a great solution but the prospect always wants to see it in action. First prize would be for the P3 concepts to work dynamically at the home church of the author but perhaps thought and prayer could be given to try and broaden the excellent concepts of P3 to a wider group of churches to give a greater chance of a group of people “implementing” the P3 principles. Perhaps there could be a P3 network of participating churches or something similar? If a reference, case study, actual example of P3 “working” then I am sure suddenly everyone would be very interested. The P3 series was taught extensively in our church (Village Church Lonehill) a few years ago and I have seen a difference to the way people minister to one another. It’s quite a shift in thinking from ‘praying’ for healing to ministering through proclaiming healing in the name of Jesus. Still, I think people earnestly want to imitate Jesus and the way he ministered so it’s worth making the effort to shift. I personally was touched and healed by the power of Jesus when a fellow church member proclaimed healing over me for chronic nerve pain after shingles. I was healed of the neuralgia and could stop all medication after that night. We all gave thanks and glory to Jesus and his amazing mercy and grace. Last November I again experienced deep emotional healing when a friend and fellow church member proclaimed healing and the truth of Jesus over me in his name. It made a huge impact when she declared truths from the word and proclaimed me healed and whole in the name of jesus. It’s so wonderful to be in Christ, but also to have close friends in the church who step out filled with the Spirit and faith. What’s really important to remember is that it’s not P3 as a ‘programme’ that works, but the power of Jesus declared in the same way as he himself did. I would also love to see more Christians take hold of the principle of proclamation, but that is in part what this blog is for.